The site is a well-known tourist attraction by the Lakes of Killarney. Remains: the church, transept chapel, tower and friary are complete. 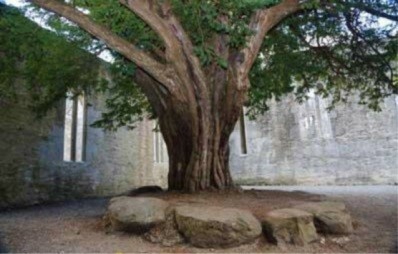 Donal McCarthy Mór founded the friary of Muckross for the Observant friars about 1448. Building continued for nearly fifty years. The friary was dedicated to the Holy Trinity. The community was legally suppressed in 1541, but the friars were able to remain in residence until about 1589, when two friars were killed during an English raid. The Franciscans returned about 1600, again about 1612, and at least by 1639, having been driven out on the two previous occasions. The Cromwellians expelled them again in 1652. The friars withdrew to a place of refuge, probably Friars Glen on the side of Mangerton. About 1760 the few remaining friars moved to a cottage at Faghbawn, by the Flesk River. By now the community was reduced to two, yet the friars started a college in 1780 on the site of the present Scott’s Hotel in Killarney. This eventually grew into the Diocesan College of St. Brendan. The last friar, Fr J. FitzGerald probably left Killarney in 1849. When the Belgian friars came to Kerry in 1860, Fr. FitzGerald was Guardian of Waterford friary. He died at Athlone in 1880.